Pumpkin seeds used to just be thrown out with the rest of the pumpkin “goo” that resulted after carving your pumpkin. But today enterprising cooks have found a variety of ways to roast the pumpkin seeds and serve them in delicious recipes. 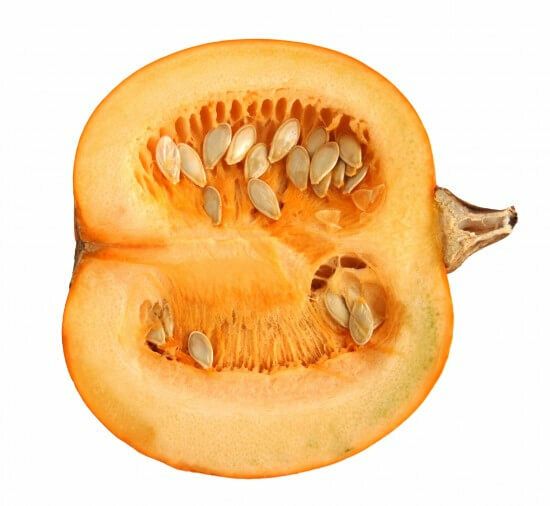 It is important to keep in mind that you can not quite cook the seeds straight out of the pumpkin, but it’s almost that easy. If you would prefer not to lose the pumpkin flesh flavor you can use a damp kitchen towel to wipe off the seeds otherwise simply rinse them off and pat dry with a kitchen towel. For a stronger salty flavor you can boil seeds in salted water. Let the pumpkin seeds simmer for 10 minutes before draining and drying. Roasting your pumpkin seeds means putting them in a hot oven or skillet. You can also cook them in the microwave. 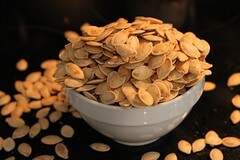 Oven roasting is simplest recipe for deliciously browned pumpkin seeds. 1. Pre-heat your oven to 300 degrees. 2. Toss seeds in a bowl with one to two tablespoons of melted butter or olive oil. For a lower-fat version, skip the oil and butter and use cooking spray on your baking pan. 3. Place in a single layer in an oven-safe dish or on a baking sheet. You can also roast your seeds in a stovetop frying pan. Just be careful that you stir and/or shake the seeds as they are cooking in the skillet, so they do not burn! 1. Heat one to two tablespoons cooking oil or butter in your skillet, on medium heat. 2. When the oil’s hot, add your cleaned seeds. 3. Stir and flip as they cook, which should take no more than five minutes. 4. When the seeds are nicely browned and toasted, remove them from the skillet. You can also place them on a paper towel to drain excess oil. 5. Season as you like (adding a little salt is always delicious). 6. Let them cool, then enjoy! Best of all there is a huge number of ways to use your roasted pumpkin seeds. And if these recipes do not fit your taste buds create your own using some imagination and the contents of your spice cabinet! Directions for the recipe: Preheat your oven to 375. In a medium-sized bowl whisk together the egg white, sugar, cayenne and salt and the mixture is frothy. Add the pumpkin seeds and toss well. Carefully drain off any excess egg white (using a strainer) and place seeds in a single layer across a baking sheet. Bake the pumpkin seeds for about 12 minutes or until seeds are golden. Sprinkle with a bit more sugar and cayenne pepper when they come out of the oven. Makes one cup. Directions for the recipe: Preheat your oven to 375 degrees. In a medium-sized bowl whisk together the egg white, curry powder and salt. Add the pumpkin seeds and toss well. Carefully drain off any excess egg white (using a strainer) and place seeds in a single layer across a baking sheet. Bake the pumpkin seeds for about 12 minutes or until seeds are golden. Sprinkle with a bit more curry powder when they come out of the oven. Makes one cup. Black Tea & Butter Pumpkin Seeds-Keep in mind that you can use many different types of tea here. For best results choose a tea that is fragrant and has a pronounced flavor. Directions for the recipe: Preheat your oven to 375 degrees. Using a mortar and or spice grinder, grind the tea into a fine powder. Set aside. In a medium-sized bowl combine the butter and salt. Add the pumpkin seeds and toss well. Place seeds in a single layer across a baking sheet. Bake the pumpkin seeds for about 12 minutes or until seeds are golden. Sprinkle with the ground tea. Makes one cup.